At Appirio we routinely hold customer-exclusive webinars to talk about features, trends and the latest technologies in cloud computing. 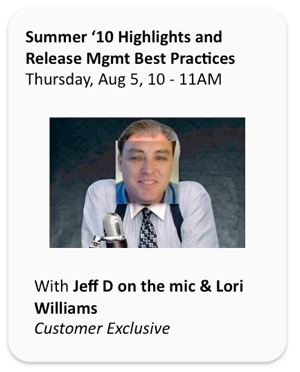 This week I'm hosting a webinar to some of our existing Salesforce.com customers on the new features released in Summer '10. This is how the marketing team "effectively" markets the event. BTW since someone asked... jeffdonthemic is in homage to "Mike D" from the Beastie Boys. I picked it up in the late 90's and it's an easy login that's always available. I tend to fight with the other Jeff Douglas for logins.